Episode VII has begun casting in the UK. Save for a few small snippets, there isn't much known about Star Wars: Episode VII. We know that it will be a sequel to the original trilogy. We know that J.J. Abrams will direct and Michael Arndt is writing the screenplay. 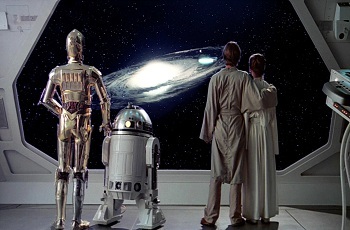 According to George Lucas, we can also expect the central cast of the original trilogy to play a part in the new films. Beyond that those bits and pieces however, Lucasfilm, Disney and Abrams have stayed fairly mum on the project. Man in late twenties, also fit, but this one is handsome and confident. Late teenage girl, independent, good sense of humour, also... physically fit . Second young female, also late teens, tough, smart and physically fit. Man in his forties, obviously physically fit, this one is a military type. A man of around thirty or so, this one is an intellectual type. Finally, a guy aged around seventy, strong opinions and tough. Granted, this isn't all that much, but we've definitely learned a few things from this information. For one, "physically fit" seems to be a primary theme, though that was hardly unexpected. Beyond that however the cast actually sounds pretty diverse. In the least, it looks like we'll have a more varied mix of characters than the prequels which were filled to the brim with boring Jedi, CGI characters and the requisite "only woman in the galaxy."